Twelve months ago, I wrote an article on CCTV called Don’t Buy The Hype. The article talked about some of the often outrageous claims by CCTV vendors and the emergence of 4K CCTV cameras. – highlight the differences in camera performance. We also outline the three most important questions you need to ask before considering 4K CCTV, particularly for external applications. 4K is the all the buzz in CCTV because of its ultra high-definition recording capabilities. 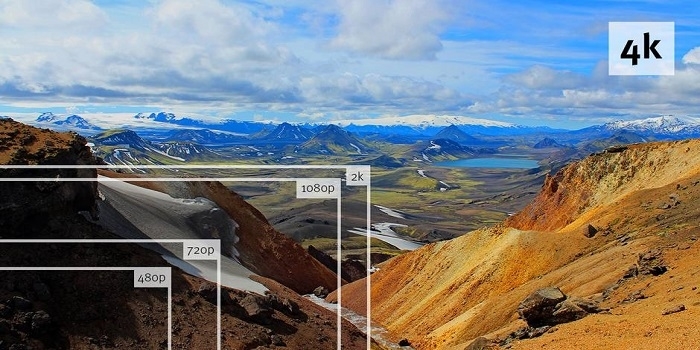 They are referred to as 4K because they have a horizontal resolution of 4000 pixels (4096 to be precise) and a vertical resolution of 2160 pixels. To put that in perspective, our TVs at home are typically referred to as HD, or true HD. Most have a screen resolution of 1080 x 1920 pixels. When watching anything on a computer monitor or TV, more pixels are nearly always better. With a resolution 4 times that of the average TV, it makes them seriously impressive to watch. In the right application, there are advantages for using 4K. 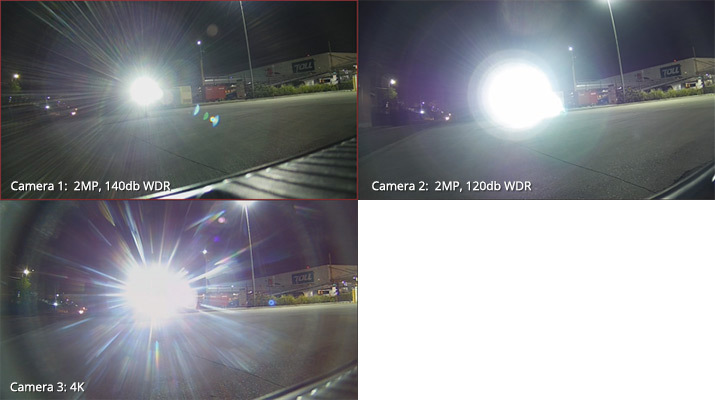 However, before we decide on 4K for our CCTV systems (below we will show you visually the marked difference in performance), there are a few questions that need to be asked. How well do they deal with motion? Are they suitable for external applications? What will the storage requirements be? Matryx has projects in Melbourne, Sydney and Brisbane right now with one of our logistics clients. They have some very specific requirements in relation to vehicle movements in and out of their terminals. As CCTV was needed, we decided to undertake an evaluation of three cameras that were being promoted by suppliers for the projects. The three cameras we evaluated are all locally available. We didn’t have a need to use 4K cameras but decided to test one against a couple of 2 megapixel cameras of the standard we were interested in. I am asked often why we recommend 2MP cameras for CCTV when you can buy 16MP cameras at the local camera store. The answer is simply because CCTV has to be able to deal with changing environmental factors that larger megapixel cameras really can’t cope with. Right now, 2MP is a nice balance for price and performance. The evaluation criteria was not too challenging however the results were somewhat surprising. The expectation was that low-light performance could be achieved without the use of supplementary infra-red (IR) illumination. My personal view is that IR is just a way of getting poor cameras to perform better at low light. So any camera that relies on IR was never going to be considered for these projects. The other criteria I looked for when evaluating cameras is good wide dynamic range (WDR) performance. WDR is very important for external cameras that have to deal with low light levels at night and exposure to full sun during the day. 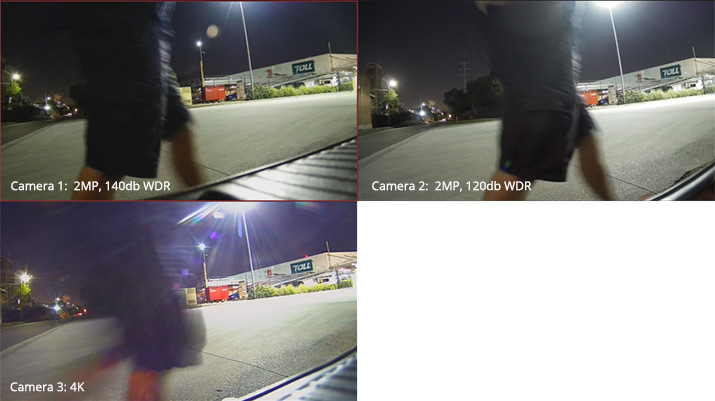 While WDR performance is not an exact measure of a camera’s capabilities, it’s a good guide. Question one: How well do they deal with motion? We thought this would be a fairly simple test – to walk past the camera! As you can see we were quite close, but we thought it was a good test of the cameras’ ability to deal with motion. The loss of detail with the 4K camera is considerable and was the first surprise of the night. Another quite simple test, was a gentle jog past the camera. Again, while we were quite close to the camera, the expectation was that this should not be too challenging for any decent CCTV camera. And again, the image blur with the 4K camera was surprising and highlighted its inability to deal with motion. 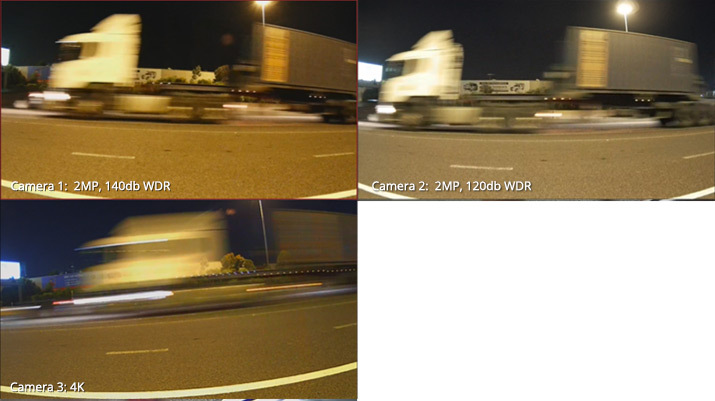 As the main aim of the cameras in this application was to record heavy vehicle movements, we tested the cameras for that exact task. This test was conducted as trucks were leaving a depot and were estimated to be travelling at 10kms/hr or less. 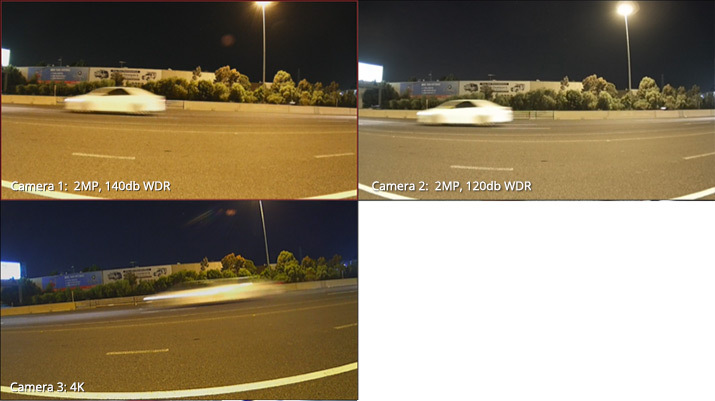 At low speed, both 2MP cameras performed quite well and provided enough detail to pass this test. The 4K camera is literally a blur and highlights why it would be a poor choice in this application. Few cameras are going to be able to cope with capturing vehicles speeding down a freeway. But that didn’t stop us testing the cameras again anyway, just to see how they would go. The first test was with trucks. And then again with cars. Both 2MP cameras performed admirably in what was about the toughest of test conditions. The cameras here are positioned at 90 degrees to the speeding vehicles so they have very little time to capture the images. The 4K images in both tests are unusable. 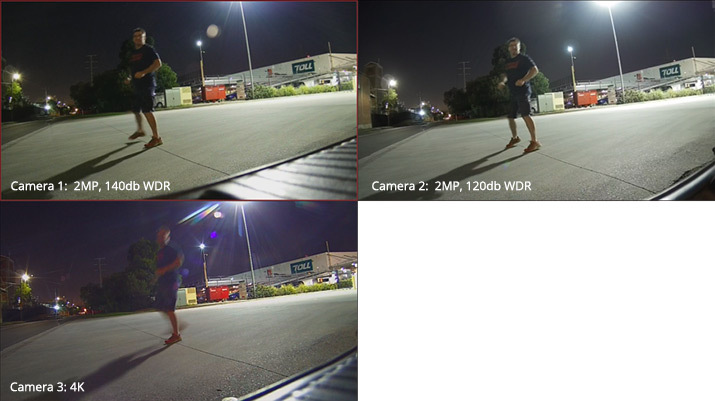 Motion is evident in just about every CCTV application so it simply can’t be ignored and the importance of a cameras ability to accurately capture motion is critical. That is what we rely on our CCTV systems to give us. This is not to say that 4K cameras are not suited to applications with motion. Far from it. But on this night with this particular camera, it is very clear that the 2MP cameras are better suited to this application. Question two: Are they suitable for external applications? The last test was to see how each of the cameras would perform when exposed to direct light. This test is also quite challenging but it is something that external cameras need to cope with. This is where WDR performance is most important. All three cameras have done pretty well here. 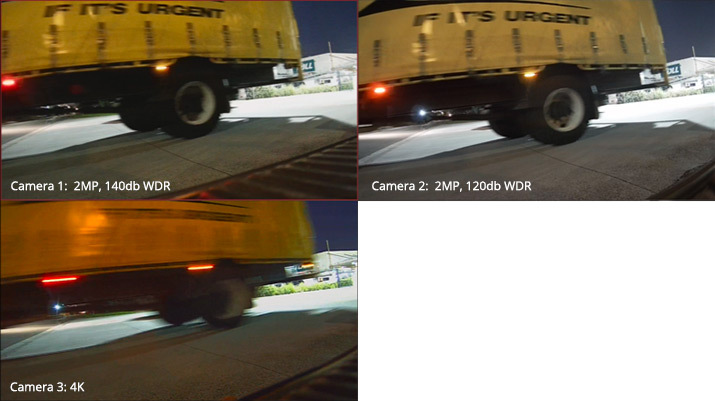 Camera 1 which is rated to 140db for WDR performed the best in my view but there is not much in it. In image 1, there is a yellow cabinet visible just to the right of the light. Notice that it is not visible in either of the other two images. The feet of the person holding the light are also visible with camera 1 but not in the other two images. The 4K camera has not performed poorly in this test. It just hasn’t performed any better than the other cameras being evaluated. We have addressed both motion and lighting in our tests. Storage was the third point that also needs to be considered. Question three: What will the storage requirements be? File sizes are significantly larger with 4K cameras meaning storage requirements can multiply very quickly with their use. Rule of thumb tells us that if there is four times the data, storage requirements will need to increase accordingly. It was obvious that was going to be the case here. One of the arguments to counter the storage needs of 4K cameras is to record at lower frame rates. I personally don’t subscribe to this theory and believe that anything less than 8-12 frames per second is simply cheating and not in the client’s best interests. In Australia there are more than 4000 different CCTV cameras available to us. For internal applications you could probably use 90% of them and get an OK result. External applications are always tougher. In Australia there are more than 4000 different CCTV cameras available to us. We have to look past what the sales literature is telling us and identify what we are not being told. It’s only through challenging the sales literature and by asking those three important questions that you will get the best camera for your project.